http://www.ualr.edu/slcrump/portfolio/index.html, but UALR has subsequently discontinued support for this server and has taken it down. However, I kept a backup copy in WordPress which is how you are reading about this. Thank You for your time! 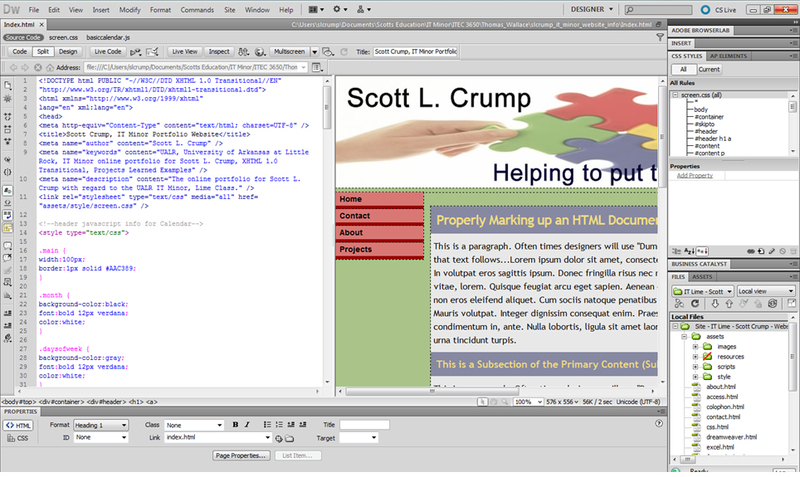 The above screenshot gives a good example of the different powerful tools that Adobe Dreamweaver provides. This is Split View which allows me to look at the XHTML 1.0 Transitional coding and the Graphical User Interface which gives me a sense of what my end users will see on the internet when they access my online portfolio. On the right hand side is the CSS Styles window which for my purpose with the I.T. Minor Portfolio is called “screen.css” simply because the viewing source is the monitor or screen of the computer or laptop that is being used to view my portfolio. Eventually I’ll build a “print.css” for the print version, but I just haven’t gotten there yet. I really like that there is an online (server) view and an offline (computer) view of the files, that way I can keep what I need to function with on the server, and keep backup and previous versions on my computer. This is enabled by cloaking those versions of files and folders that I do not want to be uploaded or viewable by the server. Very handy trick, Thank you very much Professor Thomas Wallace for showing the Lime Class that. I really like that there are three different views of the same files: 1. Code view which is just the HTML or XHTML code when I just want to focus on that, 2. Design view which is the GUI thing we talked about a moment ago and 3. Split View which is my favorite because I can see both the code that operates the item and what it looks like on the screen simultaneously. Adobe Dreamweaver is a very powerful tool to use for building and maintaining web sites. At first all the options may look daunting, but there is a reason why this program is the industry standard amongst professional web designers and administrators. Think of it like the Swiss Army Knife of Web Administration Tools. It has all the tools you need, some of which you won’t realize you do until the circumstance arises that you do, you’ll be grateful that it’s there when that time comes. Definitely take the time to do the tutorials for Adobe Systems Software which can be found at http://tv.adobe.com/ they will help you through the rough part of getting familiar with the software, or on the occasion that you happen to forget something important, it’s there as a refresher to remind you. Good luck and enjoy working with Adobe Dreamweaver!